Through training on leadership, culture, and sales; we’ll align your team’s Communication, Organization, Relationships and Engagement and help you develop a clear cut strategy designed to remove the chaos and connect you to the real Power you’ve been searching for. We’ll focus on closing the gaps within your people, purpose, and process: providing immediate relief; the right tools to practice with; and ultimately, sustainable power in: productivity, performance and profit. How would you describe the team responsible for your organization’s strategy and execution? Are they empowered leaders driven by serving others, or mere manager’s protecting their positions? Leadership is demonstrated through thoughts, conversations, and actions. As an owner, or top executive; you are responsible for setting the standards your people need to emulate; meaning: you are responsible for the quality of how they think, speak, lead and act. As the saying goes: if you’re not the lead dog, the scenery never changes. Want to create powerful impact with your questions? Provoke more thoughtful answers? Discover the secret of true servant leadership? Define which questions are relevant to driving higher performance & productivity for a culture of excellence? With wisdom, experience, and a splash of humor; Carla delivers engaging and relational training that provides owners and top executives with the tools and knowledge to transform managers to empowered leaders and convert associates into power producers; creating unprecedented competitive advantages! I can sum up my experience with Carla with one phrase “I felt educated” The great thing about Carla is that she teaches from experience. In my opinion there’s no better teacher than someone who has lived it. I walked away from her course with knowledge I could use to be a better asset to my company. And an important point is that even though I was trained with a group of people it felt like a personal experience, Thanks! Like dirty laundry…a chaotic culture has a negative impact each passing day that it’s not dealt with. Do you need to refresh your dirty laundry with the sweet smell of success? How connected is each department to the overall strategy? How likely would the associates be to recommend their environment to their friends? How experienced is the board at proactively pushing toward the future? How is the level of execution on project plans perceived? How do organizations deal with a family member or partner who’s creating dysfunction? We replace the “blame game” with a cleaner and more powerful solution for sifting through the dirt. Our culture improvement process explores the fundamental causes of lackluster cultures; provides tools to resolve conflict; and creates positive relational engagement – resulting in a healthier environment that looks so crisp and smells so fresh that it will: attract a new level of talent, increase commitment, and return true leaders. Does the daily communication that’s charging at you resemble an elephant? Have you ever been embarrassed by an email your company or an associate generated? Are your emails effectively getting answers? Would you describe your last company meeting as engaging and thought provoking…or are you just hoping your team will suddenly “get it”? Organizations as well as personal relationships derail because people hesitate or refuse to say what they are really thinking. Many people don’t know why they think the things they do or grasp the impact their thoughts and words have on others, image, or their leadership abilities. Trust comes from understanding thinking and communication styles; whether for informing, persuading, leading or simply entertaining. 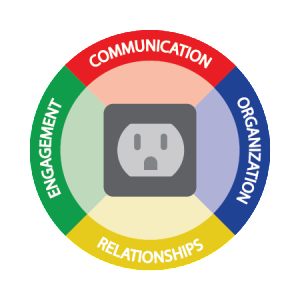 Leveraging the connection between your thoughts, words, and actions – then discovering how they affect behaviors in planning, productivity and performance plugs you into real power! Does your sales team complain about their “have nots” rather than focusing on achieving powerful results? Could your team define what customer intimacy means? How would you determine if they are correct? How is it measured? Why should anyone care? Has your sales process been documented and all of the steps been perfected? Our inspiring workshops have the power to propel your team from the complaint pit to a powerful selling process! Incorporating human behavioral tendencies and psychological selling techniques, we’ll enlighten your team with the wisdom to understand which questions must be asked, why a no is as powerful as a yes, and the critical components to sustaining sales success. The High Test – Peak Performance™ Boot Camp was a challenging, thought provoking, useful and a powerful exploration of my personal and vocational experiences. With Carla`s guidance I was able to experience how this understanding inspires my professional development. If I had to sum up the High Test – Peak Performance™ training class that I attended in a few words I would describe it as thought-provoking, educational, and worthwhile. If you are looking for improvement in the areas of communication and all around human interaction in the business or social world I would highly recommend this course.